One Sunday night soon after moving to Paris, some new friends and I found ourselves in the Marais district without any plans for dinner. It can be notoriously difficult to find open restaurants on Sunday evenings in the City of Light, but luckily, one person among us had a place in mind. There we sat, crowded around a tiny table, as plate after plate of simple yet delicious fare was delivered to us. The bustling energy of the space was exhilarating, and the cooks singing along happily to a raucous playlist of vintage hits only added to the experience. The real star of the evening, however, was a dish that will stick with me forever: a simple whole roasted cauliflower. Doused in olive oil and roasted to perfection, this was like no other cauliflower I had ever tasted. Served plainly on a sheet of parchment with a toss of coarse grey salt for seasoning, it was love at first bite. Not yet having any real bearings in my new home city, I continued for many weeks to make my pilgrimage each Sunday to this food haven. I tucked into many a cauliflower before it dawned on me to attempt making one of my own. The version I came up with is a smidgen more elaborate as it involves the addition of a cheese sauce, but I think the resulting combination is worth the extra effort. Cheese sauce, or sauce mornay as it is known in traditional French cooking, is a derivative of béchamel, which is considered one of the five mother sauces in French cuisine. If you have never made one before, I think you will find the steps are quite simple. It is a great sauce to know how to make, not only for this dish, but also if you happen to be as big a fan of mac 'n’ cheese as I am. Traditionalists will dock me for adding black pepper instead of the white variety used more classically, but I’m not a fan of being fussy. Using what I have on hand is the name of the game in my kitchen. Of course, cauliflower can be roasted without the extra step of blanching it, as this recipe calls for. But a blanched cauliflower is incredibly moist and smooth, whereas just roasting renders a drier and firmer vegetable. This recipe is best when it is served fresh from the oven. If serving it alongside other elements as part of a larger dinner, I suggest putting off the final step of reheating the cauliflower with the cheese sauce until the last moment. Prep each cauliflower by removing any outer leaves with a paring knife. Cut carefully so that each cauliflower remains whole. Trim the stems so that each one can sit flat. Fill a large pot three-quarters full with well-salted water and bring to a boil. Add the cauliflower, one at a time, to the boiling water floret-side down and allow to cook with the lid on for 6-8 minutes. Test the cauliflower for doneness by gently piercing with a knife. The stalk should be softened, but still firm. As it will continue to cook in the oven after, leaving the cauliflower a little undercooked is better than overcooking at this stage. Carefully remove the cauliflower from the boiling water using two large slotted spoons or a spider. Place the cauliflower on a large plate for 10 minutes and allow any excess liquid to steam and strain off. Repeat with the second cauliflower. In a small saucepan, melt the butter and whisk in the flour over medium-high heat to form a roux. Allow to simmer for 1-2 minutes while continuing to whisk occasionally. Gradually whisk in the cold milk a little at a time, making sure it is fully incorporated between each addition. Whisk in the grated cheese until it is fully melted and a smooth mixture is achieved. Remove from the heat and season with salt and pepper. Lay a piece of parchment paper across the surface of the sauce in order to prevent a skin from forming. Keep aside until the cauliflower is ready. Place each blanched cauliflower stem-side down in a parchment-lined glass baking dish. Divide the olive oil in half and pour evenly over the entire surface of each cauliflower. 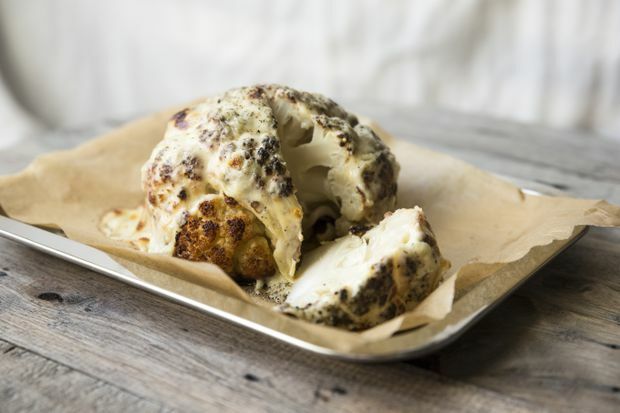 Place in the oven and allow to bake for approximately 35 minutes, or until the entire surface of the cauliflowers become deeply browned and roasted. Rotate halfway through baking. Once the cauliflower has become sufficiently roasted, remove it from the oven. Discard the parchment from the surface of the mornay and re-whisk the still-warm sauce until smooth. Spoon half of the sauce over each cauliflower and pop the whole thing back in the oven. Cook again for 5 more minutes. Garnish with freshly cracked black pepper and serve immediately.